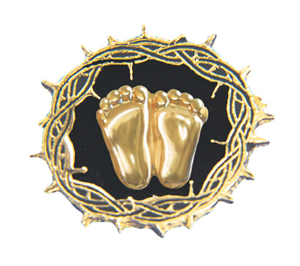 Description: One of our most popular pieces - the crown of thorns surrounds the Precious Feet on a black background. Gold Electroplated. This pin has has been a conversation starter as I teach at a high school. Students have asked me, "What's that you're wearing?" I explain to them that it's a replica of the size of the feet of a 10 week old unborn child and let them have a closer look. It's such an opportunity to explain to them the sanctity of life and especially as they can see that it's feet and not a blob of cells. The crown of thorns surrounding the feet is a powerful testimony to the love of Christ for the unborn child. This pin is an outstanding piece of jewelry. I wear mine all of the time. 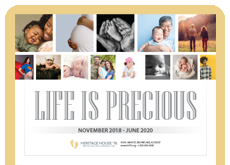 Many people stop and ask me about it and that gives me a chance to promote the pro-life cause. I wear this pin to most of the Life functions I attend. I feel the crown of thorns sets off the feet in a way that is striking and thought provoking. It is also a subtle reminder of why we work so hard to promote life. I wear this pin mostly at church functions and meetings. The pin allows me to share that Jesus died not only for me and the person to whom I am talking, but also for the millions of aborted babies since 1973. This is my new insignia! I used to wear military insignia which would identify which military unit I belonged to...now I proudly identify myself with the abortion abolitionist movement with this pin! I love that it symbolically ties the horror of abortion to the healing offered in Jesus Christ. These are my favorite Precious Feet pins. The crown of thorns adds a very special touch to the "standard" Precious Feet, the symbol of the Pro-Life movement. I recently gave a set to a very special person who has suffered mistreatment from others because of her Pro-Life views. When I heard her story I knew the true meaning of this special pin. Blessed are they that suffer persecution for justice sake: for theirs is the kingdom of heaven. After completing my abortion recovery, I purchased several of these pins and have worn them proudly. It's a great way to share God's forgiveness and healing from abortion. I have since led many groups of women through recovery and have purchased pins for them. This pin was given to me when the pregnancy center, I went to for post abortion healing, held a memorial service for my aborted baby. I wear this pin proudly in memory of my son and the crown of thorns reminds me that I am forgiven and set free by the blood of Jesus Christ. I will be a voice for the unborn! I have had my precious feet pinned to my uniform jacket for a couple of years, and have had many compliments by the patients I meet at our local hospital where I volunteer. My first order was for 100 pins. I bought my pin several years ago while I was living in Florida. Have continued wearing it and continue to receive many compliments. I love this pin. Have received many compliments and am constantly asked to explain it's meaning. Pam, Try the pins with the magnetic back. I love mine and ordered several to give out. My daughter gives out the original precious feet pins to those who ask for them at her high school. She's given out a lot of them. I'm also getting a yard sign to help inform others. I liked the look of this pin online, but when I received it I was rather disappointed that it was larger and showier than I was expecting. 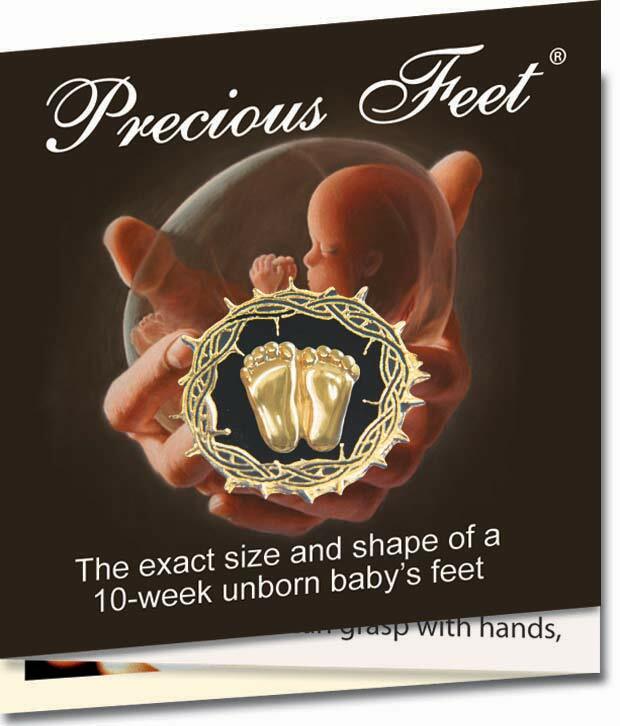 I prefer the more subtle traditional Precious Feet pin. This design also has a larger pin the back, and was more likely to leave holes in my shirts. This is an outstanding product. My wife and I wear them everywhere.